The economic and political rise of the BRICS (Brazil, Russia, India, China, and South Africa) and Middle-Income Countries (MICs) have important implications for global agrarian transformation.These emerging economies are undergoing profound changes as key sites of the production, circulation, and consumption of agricultural commodities; hosts to abundant cheap labour and natural resources; and home to growing numbers of both poor but also, increasingly, affluent consumers. Separately and together these countries are shaping international development agendas both as partners in and potential alternatives to the development paradigms promoted by the established hubs of global capital in the North Atlantic and by dominant international financial institutions. 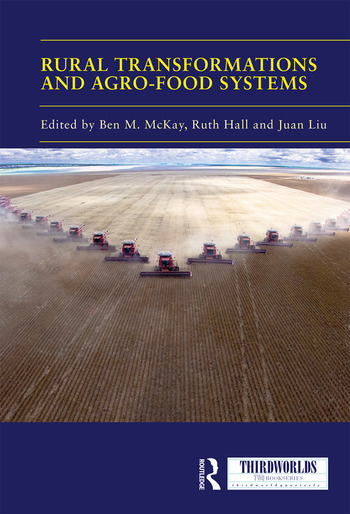 Collectively, the chapters in this book show the significance of BRICS countries in reshaping agro-food systems at the national and regional level as well as their global significance. As they export their own farming and production systems across different contexts, though, the outcomes are contingent and success is not assured. At the same time, BRICS may represent a continuation rather than an alternative to the development paradigms of the Global North. The chapters were originally published in a special issue of Third World Thematics: A TWQ Journal. 2. China and Latin America: towards a new consensus of resource control? Ben M. McKay is an assistant professor of Development and Sustainability in the Department of Anthropology and Archaeology and fellow of the Latin American Research Centre at the University of Calgary in Canada. Ruth Hall is a professor at the Institute for Poverty, Land and Agrarian Studies (PLAAS) at the University of the Western Cape, South Africa. She is a co-founder of the Land Deal Politics Initiative and the BRICS Initiative in Critical Agrarian Studies, and coordinates the work of the Future Agricultures Consortium in Southern Africa. Juan Liu is an assistant professor at the College of Humanities and Social Development, Northwest A&F University, China, and a postdoctoral researcher at ICTA, Universitat Autónoma de Barcelona, Spain. She is in the global secretariat of the BRICS Initiatives for Critical Agrarian Studies (BICAS) and is co-editor of the BICAS Working Paper Series.